Tumors vanished. Marriages restored. Souls healed. Revival is breaking out as hearts unite with God as He restores what everyone thought was lost. More than 2000 soldiers have graduated from the program, and not a single person has committed suicide, a rampant epidemic stealing the lives of 20 of their peers every single day. "Faith impacts everything we do," says Evan Owens, executive director of REBOOT Combat Recovery. "As Christians, we are all called to be a bridge, be a people who lay down their lives so other people can cross. We're not experts, but what we can do is say, 'God, I'm here and I lay down my life to help my fellow man.' That's our role, to lay down our lives again and again." Owens' wife, Jenny, founded the program in 2011 to serve and heal combat veterans and their families after the trauma of war. The more than 2000 graduates experienced more than mental health treatment; they've been supernaturally healed of soul wounds often suppressed by the violent reality of nonstop war. Together, the Owenses battle spiritual warfare and follow prophecy to serve their fellow man. In one prophetic word, a preacher called on Owens from the pulpit. "He talked about the gifts in our lives that we had put on shelves, that it was time for us to step out in leading others in faith, to take them off the shelf to lead people. He said it involves [us] traveling and helping hurting people in small communities across country." 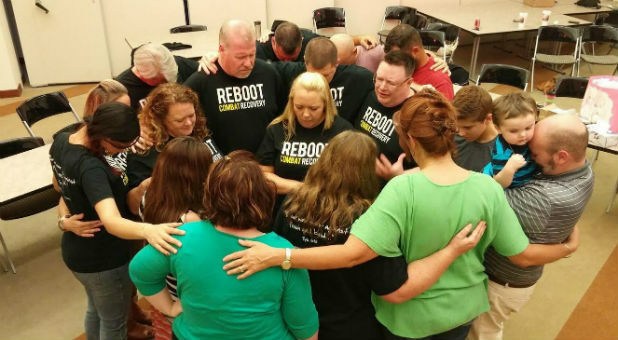 Now, REBOOT meets mostly in churches with church members as the support staff. REBOOT provides the materials and local believers volunteer to walk with the veterans through a 12-week process. The entire program fulfills a prophetic vision one young lady gave Evan a few months after REBOOT's birth. "She approached me, and there was this lion thing she was talking through," Evan says. "She said it was an opportunity to do something, but there would be a season of frustration before it. I thought it sounded a little hocus-pocus, that we needed to verify because it was so generic. Then, low and behold, crazy stuff started happening that wasn't biased, and I couldn't have made this up! This is pretty wild ... We were given specific access to open doors that no one said was possible. We were told that with the open doors, we should sprint through it, and more doors would open." Revivals broke out. Small groups soon ballooned to more than 50 as people came in off the street and saw the raw power of God. Men and women who had lost the ability to walk had their steps restored; someone with speech atrophy found words again. But the most impressive miracles were those in the heart. "You could visually see their countenance change, like very tangible change," Evan says of watching spouses and families forgive one another. One woman attended the group with her ex-husband as he battled post-traumatic stress disorder. Through the program, the couple fell in love again, God restored their marriage and they said their vows once more while wearing REBOOT T-shirts. God is moving, Evan says, and He's using His people to bring about restoration. In 2014, the latest year available, more than 7,400 veterans took their own lives, accounting for 18 percent of all suicides in America. Veterans make up less than 9 percent of the U.S. population, according to the Military Times. "The war we fight is not against flesh and blood. For many service members, the war doesn't end when they come home. The battle continues against an unseen enemy who is attacking their mind and spirit. And in too many cases, the enemy is winning," the REBOOT website says. But with God, through the church community, Satan is losing ground. "It's really, really wild," Evans says.